Co-author Dr. Theodore Henderson reports Major Depressive Disorder (MDD) can be targeted with a new treatment that improves brain metabolism, inflammation, oxidative stress and neurodegeneration. DENVER, Colo. (March 14, 2016) — Combing hundreds of scientific studies, including citations from 60 published in peer-reviewed journals, researchers assembled a comprehensive review of a new treatment for Major Depressive Disorder (MDD) that involves a unique application of a high-powered, near-infrared light (NIR). The study, available here, published in Neurophotonics, March 2016 and is cited in the National Library of Congress (Pubmed). The review also highlighted that the required equipment and low number of applications shown to be effective point to potential for wide dissemination, as it has also been found to be safe, with no skin irritation. The method, currently in the patent process, has yet to receive FDA approval. 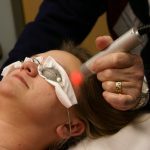 Near-infrared photonic energy penetration: can infrared phototherapy effectively reach the human brain? Henderson TA & Morries LD. — The study showed high-powered, multi-watt infrared light achieved at least 3 cm penetration into the brain. This included wavelengths of 980 and 808 nm with 9-13 Watts average power. No thermal skin irritation occurred, and skin temperature change was negligible.